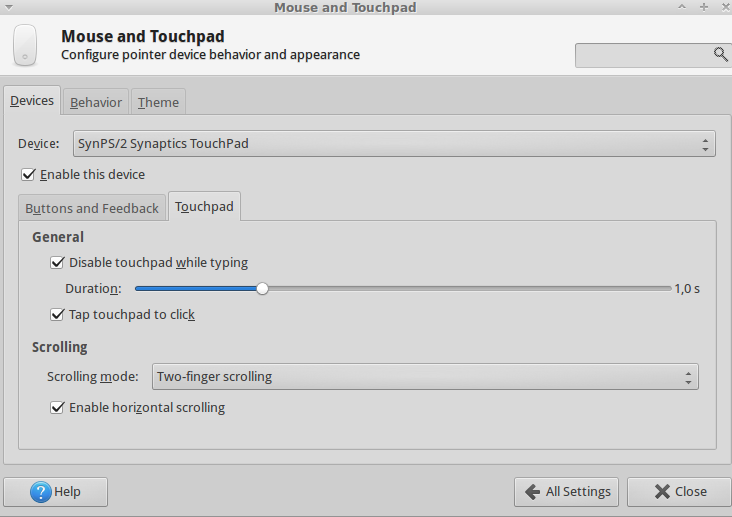 The feature "Disable touchpad while typing", which can be set in xfce4-mouse-settings is currently useless, because it's default delay is somewhere around 500ms, which is far too much for a convenient usage. The problem is that we (users) are actually unable to set a shorter delay, thus unable to use it at all. which is a working trick I've found here [https://bbs.archlinux.org/viewtopic.php?id=122314]. It is a little unhelpful that mouse movement is disabled as well as clicking. Waiting to move the mouse is a little bit bad. Ideally there should be a visual or audio cue that says that a mouse click (or movement) was dropped due to it being too early. I've just made a fresh Xubuntu 13.10 install. Disabling touchpad while typing from the mouse settings menu is still useless due to immense default delay. add that to 'startup applications' The default delay is way too long. Well, have something similar in my startup applications, but that is not the SOLUTION. The correct solution is to allow the user set it up in the GUI, as everything else he does. Indeed, there are people like us, who like and don't mind to write their own scripts and configuration files, but this is Ubuntu world, not Gentoo or Arch. Without "-t" it remains uncomfortable to use, since it blocks the mouse completely and it does not feel good. I am suggesting whether using "-t" by default silently, or offer it as a checkbox in addition to the current Touchpad -> General settings. echo -n "enabling middle click on touchpad..."
synclient TapButton3=2 && echo " OK"
echo -n "enabling horizontal scrolling..."
synclient HorizTwoFingerScroll=1 && echo " OK"
echo -n "enabling 'disable touchpad while typing' feature..."
syndaemon -i 1 -d -t -K && echo " OK"